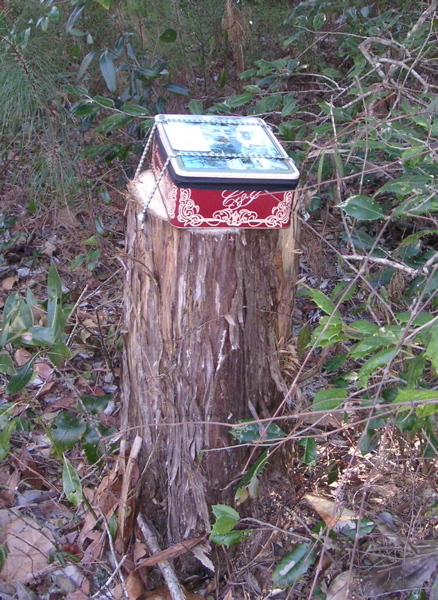 I anchored a pinhole camera to a tree stump on December 19th of last year. The Winter solstice began on the 21st, so I was a couple of days early. The tree was a nice Holly tree that had been destroyed by a Nor’easter a few weeks before. When I removed the tree, I left a bit of the stump and chopped it off at a slight angle to allow me to mount a camera on it. The camera is still there and opened up, absorbing the changes in light and life that go on around it. I forgot about the camera most of the winter until just recently. While the negative burned in… A few days after Christmas my legs and feet became weak and tingly. I have a history of back problems and have had similar symptoms in the past. So I wasn’t overly concerned. While I was in the process of having my legs checked out, I learned that I had a nodule on my thyroid gland. I had never stayed in a hospital before, so having the nodule and half my thyroid removed was a new experience to me. I was impressed at the lack of pain or discomfort in this surgery. At my check up with the doctor a few days later, he cautioned me to look out for symptoms of “hypothyroidism”. Things like less energy, depression, etc. that might mean I would need to take hormone drugs to make up for my removed left thyroid gland. Energy… A couple of days after I met with the doctor, I realized I was not only back to normal, energy-wise, but was full of new energy. No hypothyroidism going on in this body. Maybe “hyperthyroidism”? Who knows. I was suddenly all over the place. I noticed that I was brushing my teeth more than once a day and had even started flossing every day. I never used to floss until 3 days before a visit to the dentist! I started spending a lot of time cooking in the kitchen. And it wasn’t just cooking, but cooking healthy new recipies – no sugar, little salt, no carbs, little fat. Yes, my wife Carmela and I had take n up the South Beach Diet the weekend after my surgery. And loving it! Our meals had not tasted this good in years. I immediately noticed that our 20 year old pots and pans were a determent to cooking, so out they went and in came new kitchenware. Carmela and I cooked together and started loosing weight and feeling great and having a great time. What the heck was going on? Who is this guy? I had just had my throat cut, and felt the best I had felt in a long time. There were probably a lot of possible explanations for this. But even Google couldn’t explain to me what may have been happening. It wasn’t just the increased energy. All of my senses seemed heightened. Everything around seemed very clear. Everything I encountered and every thought that crossed my mind seemed perfectly correct (except maybe those pots and pans). It no longer made sense to put off doing something that could be done that moment. Everything in the house had a place and a purpose or was removed to a new home. What the heck was going on? Who’s the new guy? I don’t remember how this thought came into my head, but it all seemed to arrive at the same time. I was still me, but something new was sharing the space in my body (or most likely my mind). And I really liked this new guy (or gal?). I was up for the ride, and this guy just seemed to know what to do and took control for leading the way. I wasn’t sure what was me and what was not, but it was working really well. The more I though about it, the stranger it got. There was just this new dimension to myself, not just two guys sharing the same body/mind. Maybe there were lots of dimensions I had always just lumped into my one self, and this new dimension was pointing that out. But where did this new guy come from? Exposing over time… I remembered the pinhole camera on the tree stump. It had now been over six weeks since I strapped it to that stump. I thought about how the surroundings had changed over the last few weeks. It had snowed once, rained a few times and the wind blew often. I knew the water from the rain and snow would affect the paper negative as it dripped through the pinhole. I didn’t see any connection, really. But I suspected it would be hard to look at what comes out of that exposure without thinking about what I had been feeling. Dimensional swap? OK, here’s where it gets really weird. I had really enjoyed the general anesthesia during the thyroid surgery. But that was because I felt nothing. Reading up on general anesthesia, I gained a real respect for the doctors who take over control of a patient’s body systems and then bring them back online after the operation. So what if the operation was when the new guy, this new dimension, came on board. And what if some part of me kind of “died” during the general anesthesia? And here was this replacement guy/dimension all ready to jump in. Maybe we’re all made up of components rather than just a single “self”. That would explain things like “feeling out of wack” or “being confused” – just our components of of sync, right? And maybe the old guy/dimension had a lot of negative baggage. I sure wasn’t missing that old guy. Anyway, it might makes a lot more sense to think that I got some sort of rush off some hospital drugs, or hormone changes. But it sure feels like there’s this new guy I’m sharing my body/mind with and its working out real well. I can’t wait to see what comes out of the pinhole photo that’s still cookin’.